ST. MARY-OF-THE-WOODS—In the 1840s, one might see Mother Theodore Guérin at Saint Mary-of-the-Woods under the leaves of the linden tree she brought with her from France, surrounded by the walnut trees that populated the western Indiana landscape. Today one can still see her there lying under linden leaves and surrounded by walnut wood. The difference is that the founder of the Sisters of Providence of Saint Mary-of-the-Woods is now a saint herself, and the linden and walnut make up the chapel in the new shrine dedicated for the reverence of her holy remains. The final part of the new, permanent shrine for Indiana’s only saint opened on Oct. 25. According to Providence Sister Jan Craven, coordinator of the shrine, around 550 people traveled to Saint Mary-of-the-Woods near Terre Haute for the grand opening. Their journey did not stop at the doors of the shrine. The journey—and the shrine itself—actually begins at the entrance of the Providence Spirituality and Conference Center on the grounds of the Sisters of Providence’s motherhouse and proceeds to the Ministry Circle, which describes the various ministries of the sisters. Next on the indoor journey is a long corridor with signs and audio-narrated dioramas depicting St. Mother Theodore’s life and the history of the order she founded. The hall leads to the culmination of the shrine—the most recently opened portion located under the sister’s Blessed Sacrament Chapel. “The Blessed Sacrament was near and dear to [St. Mother Theodore’s] heart,” said Sister Jan. Originally, the shrine was to be built under the Church of the Immaculate Conception next to the Providence Center. The area comprises a much larger space than the current shrine. “Once we decided we didn’t have the money to [build under the church], we chose the space under the Blessed Sacrament Chapel,” said Sister Jan. “We tried to think how we could do what we wanted to do under the church but in a much smaller space. The first room of the newest part of the shrine, the French Room, tells the story of Mother Theodore’s life in France, her native country where she lived from 1798-1840. The room contains items from France “that were either brought by Mother Theodore or were sent to her,” said Sister Jan. Among the artifacts, which are second-degree relics, is a picture given to Mother Theodore by Queen Amalia of France when the nun visited her native country seeking financial support for her congregation in Indiana. Around the corner from the French Room is the Ship Room, depicting the size of the berth Mother Theodore and her sisters used during their journey across the sea to America. “About 90 percent of Mother Theodore’s artifacts are in the shrine,” said Sister Jan. She pointed out two of them in the Ship Room—a small suitcase and a prayer book that belonged to the saint. Next, visitors enter the Immersion into the Forest Room along one side of the shrine. The room gives visitors a feel for the densely forested, frontier region that Mother Theodore and her sisters found themselves in upon their arrival at St. Mary-of-the-Woods. “I liked [this part of the shrine], especially since our name is all over the wall,” said Bert Thralls, a member of Mary Queen of Peace Parish in Danville. He and 10 other family members toured the shrine together. Their ancestors, Joseph and Sarah Thralls, once owned the land now comprising the grounds of the Sisters of Providence’s motherhouse and Saint Mary-of-the-Woods College. The couple opened their cabin to Mother Theodore and the sisters from France, making that home the first convent of the Sisters of Providence. But the journey of Mother Theodore met with some resistance, as depicted in the next section of the shrine, called Immersion into Suffering. But her suffering was to be rewarded. On Oct. 16, 2006, Pope Benedict XVI canonized her in St. Peter’s Square at the Vatican. While she was officially designated as St. Theodora by the Vatican, the Holy See gave the Sisters of Providence permission to refer to their foundress as St. Mother Theodore. After passing a small prayer room, visitors enter the centerpiece of the shrine—the chapel containing the remains of the saint for prayerful veneration. Her remains were transferred from her temporary shrine in the Church of the Immaculate Conception to the new chapel in the shrine on Oct. 3, her feast day. On Oct. 22—Founding Day for the Sisters of Providence—Bishop Christopher J. Coyne, vicar general, represented Archbishop Joseph W. Tobin in providing the official blessing of the shrine by the archdiocese. Polished walnut seats surround the circular-shaped room. A panel carved with linden leaves forms a canopy over the handmade walnut casket. Three of St. Mother Theodore’s finger bones—first-class relics—are displayed with the decree from Rome declaring her a saint. The first-class relics and decree are also requirements for a shrine of a saint, said Sister Jan. Exiting back into the main area of the shrine, visitors enter the Immersion into American Life Room. Sister Jan points to a replica of Mother Theodore’s office. Large-print reproductions of period writings and documents are screened onto the walls, including an advertisement for washing and mending classes and Oriental painting lessons at the early Saint Mary-of-the-Woods College. Such was the foundation laid by Mother Theodore Guérin. 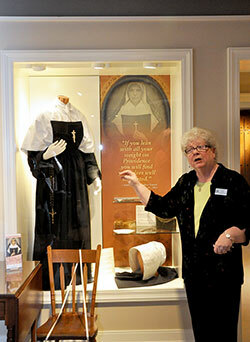 The final room of the shrine addresses the mission and legacy she passed on to the Sisters of Providence. “This whole space is about her legacy, what she left—the teaching, the schools we opened, the different things we do,” Sister Jan explained. Early photos depict the progression of the sisters’ habit designs. More recent photos show sisters at work in various ministries. The sisters themselves had to be patient and trustful, waiting for the $2.1 million shrine to be fully funded by donors before starting construction. Visitors said the wait was worth it. “The first time I went through, I just cried,” said Sandy Scroggins, a Sisters of Providence administrative staff member who helped raise money for the shrine. “We worked so hard on it, and people were so generous. From the very beginning, it was so blessed. 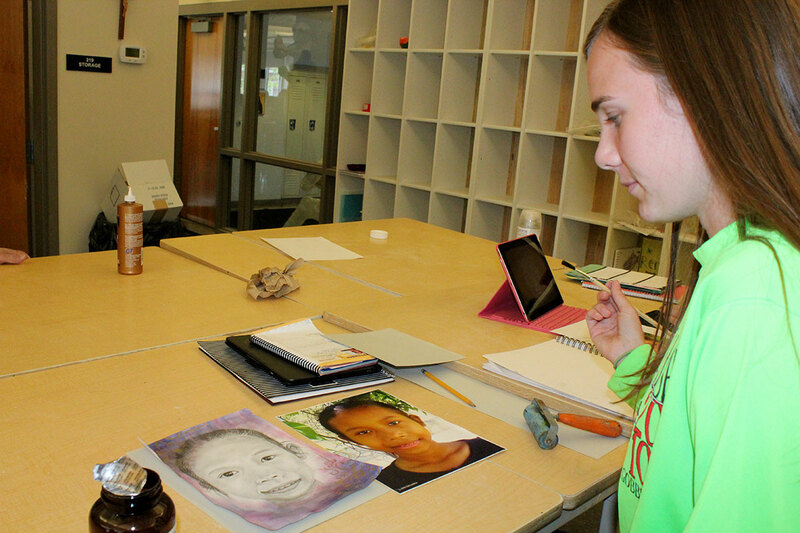 Patty Thomas, a member of St. Joseph University Parish in Terre Haute, was impressed. “I was really, really moved, especially when we entered where her casket was, she said. “It was almost overwhelming. You could just feel [St. Mother Theodore’s] presence. Dan Thralls, also a member of St. Joseph University Parish and a descendant of the couple who sheltered Mother Theodore and her five companions, shared Thomas’ impressions. The simple nature of the shrine spoke to Providence Sister Dina Bato, who works in the Archdiocese of Indianapolis’ accounting office. Sister Jan has specific intentions for those who visit the shrine. “I would hope that you would see her deep faith,” she said of St. Mother Theodore. “I would hope that you would see her courage, and that she was a human being. “I don’t think you can know the saint before you know who she was as a French woman from her time period, who she was as a Hoosier, who she was as a human being.